You may be wondering how I achieved that fascinating blurry effect around the "ENOUGH!" Reset assured, my friends, there was no digital manipulation involved. Approximately ten years ago, when I drew this comic, I lettered that word with a Sharpie. As I mentioned in a previous comment, Sharpies are not at all archival, and the lines you draw with them bleed horribly over time. 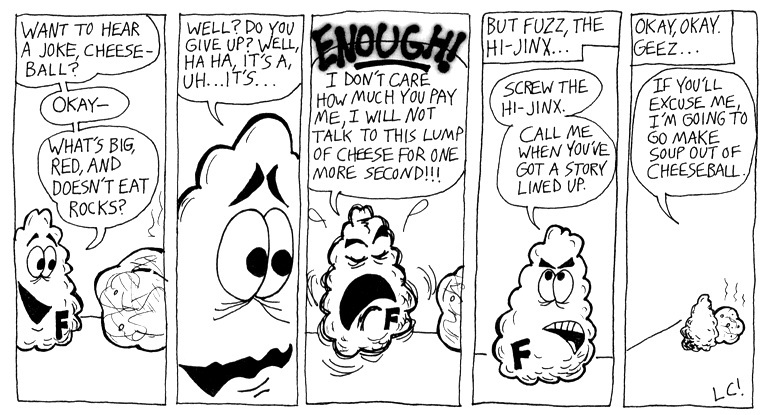 I tell you what, I wish I'd kept decent scans of these strips. But in our modern digital age, aren't these strips charmingly analog?